Graunch. GRAUNCH. GRAAAAAAAAAAUNCH. The noise from the right rear wheel wasn’t going away. If anything, it was getting worse. It didn’t help that the engine was going nuclear, either. 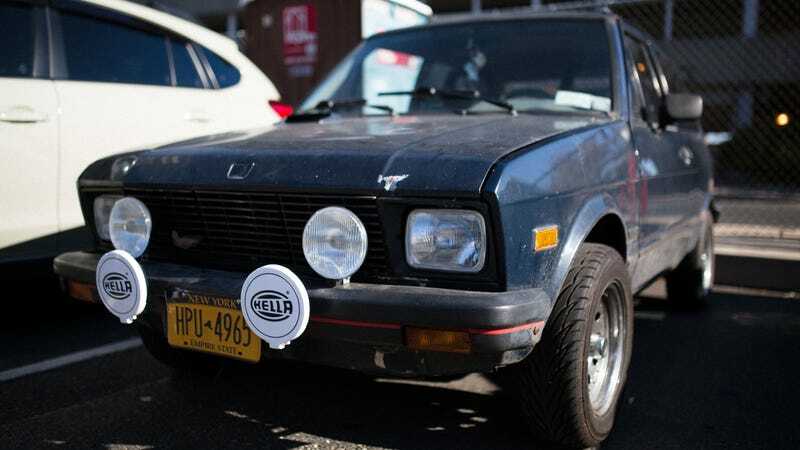 We were filming the New York episode of Car Vs. America, and my Yugo was going straight to hell. Well, technically, it was going to defeat Raph in a race to the best halal cart in all of New York City. But to explain how it got to the Jalopnik Auto Show this past weekend, it helps to go back to the TV show. And figuratively, it was all going to hell. Just to get it to the point where it was television-ready, it had to have a lot repaired. It needed new seat belts ($160), because the driver’s belt didn’t work, and the front passenger’s belt simply didn’t exist. It needed front new seats ($330, from a nice man from Craigslist), because the folding mechanism that enables you to get into the back was broken. Meaning that if you managed to get into a crash and somehow survive the initial impact, you’d be launched catapult-style out the windshield. It needed new wheels and tires, because one of the OEM wheels was so banged up that it wouldn’t hold air anymore. And the tires were crap. But that graunching noise was coming from the brand new tire rubbing against the wheel well, but as to why, it was a mystery. The new wheels I bought – with my own money for $350, plus shipping. The new tires I had purchased, also for around $200 of my own money, shouldn’t have been a problem. The 13" diameter wheels had come off an old Fiat 124 in California, and their dimensions were virtually identical to the OEM Yugo wheels. The tires, in size 185/60/R13, were essentially the same size as the old 155/70s. So where the hell was all this rubbing coming from? Once I got the car home and allowed the plasma that was once the engine to cool down a bit, I took a look with my overly generous friend and erstwhile mechanic, Jesse. It wasn’t the tire or the wheel at all. It was the suspension. Specifically, it was the shock absorber. Someone in the little Yugo’s long and storied history had stripped the nut that was holding the shock bolted to the car, and the whole thing had punched through the interior. Because in the Yugo, the interior and the exterior are sometimes one and the same. But now that that matter was diagnosed, there was the issue of the fusion core under the hood. That was a mystery as well, as to get the car pitch-perfect in time for the episode taping, I’d finally collapsed under time constraint and given it to a professional mechanic. More than $600 later, the Yugo had a brand new water pump and some drilled-out rusty bolts. And still, whenever it was driven for more than five minutes or so, the temperature gauge would peg itself to nearly the redline. And it would hold just there, precariously, and the smells coming from the engine grew worse and worse. The shop was adamant that it was, simply, a mystery. Could it be the radiator? Maybe. Could it be the thermostat? Certainly not. Could all of the little bits inside be completely clogged up with grime, and thus the engine would need a complete re-build entirely? Probably. “You want my advice? Just junk it,” the mechanic with the old-school New York accent said. We had to go film the rest of the show, however, so the Yugo would have to wait. And wait, it did. Two more months. Saw Erin Marquis, Aaron Foley, and David Tracy in Detroit. “Your problem definitely sounds like the thermostat,” David said, because he is smart and I couldn’t shut up about the car. We got back from filming on October 31st, and thanks to the first date for the Jalopnik Auto Show for Hurricane Relief getting rained out, it meant there was a shot the Yugo could make it. If it could make it. After an all-too-brief respite, I went to Jesse’s driveway, where the Yugo normally lives, to kick the tires a bit. Suspension still bodged? Engine still raging with the fires of heck itself? No idea, because now the battery wouldn’t hold a charge. It would need a new one of those, too. Ordered a new set of shocks from Italy ($60 shipped), and a new thermostat because what the hell why not ($8), and we were off to the races. And a real race it was, as after all the parts we needed had arrived, it was two days before the Jalopnik Auto Show. Once we realized the nut was stripped (after hopping up and down on the car, wondering why the top of the shock refused to let us secure it to its little post hole), replacing the shock was easy enough. It was supposed to be smooth sailing from there. We’d just swap the thermostat, enjoy a victory beer, and then drive it on to Jalopnik Auto Show glory in two days time. Little did we know. The Yugo engine, while easy to work on, has its thermostat apparently buried. We knew it had to be replaced, though, as this was a last ditch effort to end the overheating issue, and David Tracy told me to do it. No matter, all it would need then, was a bit of digging. Should’ve been easy enough. But the Yugo at this point is 90 percent rust. Jesse would stick a screwdriver or a wrench in, turn it just a bit, and seemingly every bolt or screw or hose clamp would just evaporate into dust. That is, if it wasn’t glued tight by years of oxidation. It didn’t help, either, that it was cold. And dark. And I am functionally useless when it comes to heavy mechanical lifting. We got the old thermostat out, and despite the professional mechanic’s protestations, David was right. The thermostat was completely gunked up. It was the likely culprit. “Will it make it?” I asked Jesse. I went home. Jesse said he’d work on it the next day. We only had one day left. He sent me updates throughout the day, and late at night, I got a text message from him. Still unclear. Needed a new battery, and everywhere that sold one was closed. The next morning, the day of the show, I got another text. Jesse was my savior, and I drove out to Long Island in a press car as fast as I could. Got in the Yugo, and it started right up. Not a whiff of overheating. Not a hint of that awful rubbing noise. It ran like a dream, if your dreams are borne out of intense fevers and a desire for Yugoslavian communism. Driving it the 50 miles or so to the Jalopnik Auto Show was precarious as usual, but it all went off without a hitch, as long as you don’t count the swaying every time it encountered a stiff breeze. Driving it home, on the other hand? I guess some things can’t be fixed.